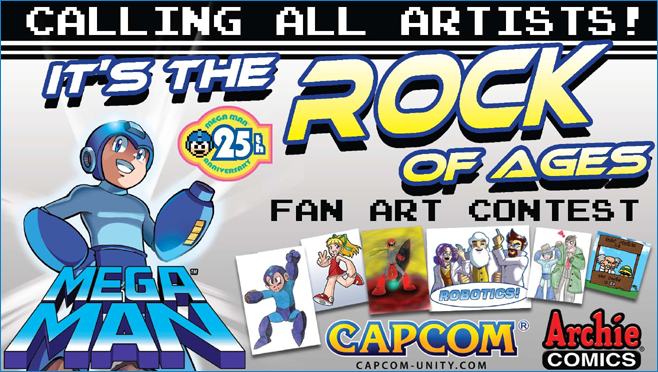 WE’RE CELEBRATING 25 YEARS OF MEGA MAN WITH OUR FIRST EVER FAN ART CONTEST! Submit fan art of any kind that showcase Mega Man and/or his universe! Entries can be any form of visual art. One grand prize winner & 3 runners-up will be chosen! All winning entries will be shown on the Capcom-Unity blog! 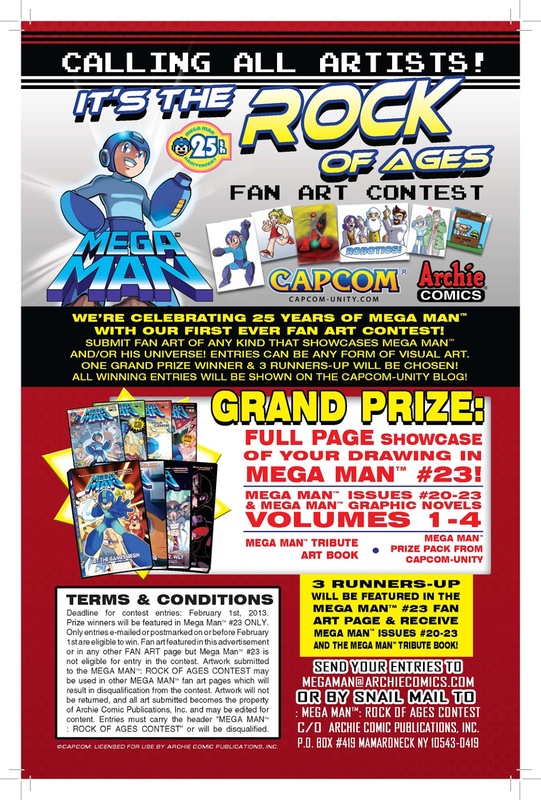 Full page showcase of your drawing in Mega Man #23! ALL CONTEST ENTRIES DUE BY FEBRUARY 1! "Artwork submitted to the Mega Man Rock of Ages Contest may be used in other Mega Man fan art pages which will result in disqualification from the contest." Does that mean it can't be posted publicly before the contest winner is announced or, what? This really reminds me of the good old days :) Say what you want, but this is definitely a great idea by both to do for the anniversary. Hmm...I've already got all four GNs. :/ Guess my sisters can have them if I enter and win. I'm curious as to what's in that Capcom Unity prize pack. Is this contest limited to the USA/Western countries? what's pretty sad is that some of the fanart will probably be much better then the art in the comics themselves since the artwork in the archie comics is pretty bad. @January 8, 2013 12:54 PM: Well if the comic were capable of selling millions of copies every time a new issue was released, I'd bet it would have better art. But obviously it doesn't. Not Spaz's stuff! His work is top notch!